A story falls apart when both principal characters adopt each other’s perspective. An apt title for a film that, structurally, is all over the place, Tangled joins the rare club of superbly entertaining films without a story. There are films that say something and films that are about something. 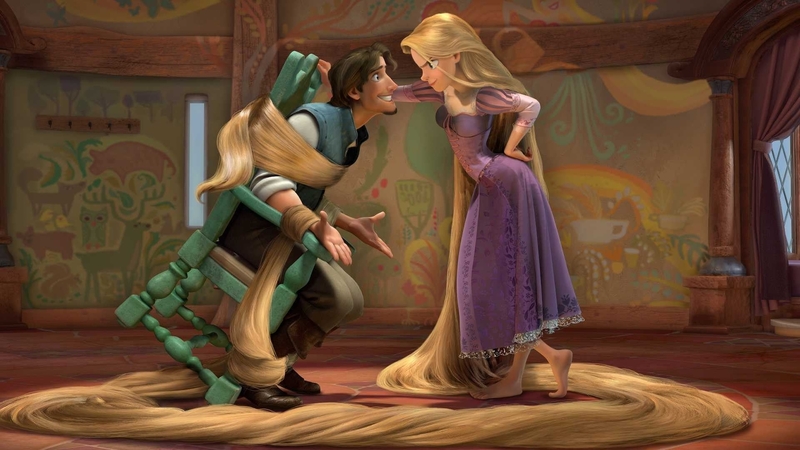 Tangled fulfills the latter—a tale chock full of beautiful and well-observed character animation worthy of the legacy it aspires to. A tale that in the end, doesn’t add up to much of anything. There are two core problems with the structure of the film, both of which have nothing to do with the tears that magically appear at the end of the film. How the heck is anyone supposed to remember that a single tear of sunlight (the only setup to this payoff) started this whole fiasco? The healing tears represent a huge cheat - a Disneus Ex Machina for the 21st century. The first major problem structurally surrounds the Main Character’s Resolve. Ignoring for the moment the confusion surrounding exactly who the Main Character is (one would believe that it’s Rapunzel, yet there are moments when it seems to be Flynn), the fact that BOTH change their unique points-of-view breaks any meaning the story could possibly have. Complete stories argue the appropriateness of a unique approach towards solving problems. An Author proves this by having two conflicting paradigms clash (the Main Character and Impact Character) and showing how one changes to adopt the other’s. When both change, what is the Author trying to say? Flynn clearly changes from rogue to saint. Rapunzel clearly changes from accepting that mother knows best to understanding that mom is nuts. Both experience huge paradigm shifts, both contribute to a garbled argument. The second major problem structurally surrounds the Overall Story and the complete lack of a clear Story Goal. It appears that the Goal is for Rapunzel to “see the lights”, yet she accomplishes this with about 40 minutes of screen-time left to spare. When the Goal is achieved in a story, the story is over. That is why when she finally sees the lights, Tangled comes to a screeching halt. It’s a beautiful moment, but the audience is left scratching their heads wondering Ok, now what? Some quick fumbling around by the baddies adjusts the dynamics, but by then it is too late—the audience has lost the thread. The Story Goal is an essential part of what a story means. To change it 2/3 of the way in is to change what the story means. A Story Goal needs to be set up within the First Act and remain constant throughout the Final Act for the Main Character’s Resolve to have any appreciable meaning. Their decision to either Change or Remain Steadfast—in conjunction with the Success or Failure of the Story Goal—determines whether they were right or wrong. It proves what the Author was trying to say - it satisfies the Author’s Original Intent. Unfortunately Tangled had no original purpose (no One Author), or at the very least, it lost that purpose along the way. A valiant effort to piece together a cavalcade of different interpretations of the story over the course of seven years. Regardless of how beautiful the animation turned out and how entertaining those individual moments are, this film remains a collection of wonderful moments in search of a story—a menagerie of different threads desperate for someone to step in and untangle.